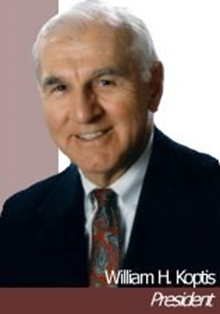 Bill Koptis accumulated over 50 years of experience in the insurance and financial services industry. He was a seasoned authority on the complexities of the closely held business and the transfer of wealth in estates. Bill was truly gifted with insight and wisdom. Bill admired and respected his business clients living by the mottos, “He who serves best, serves most”, “Service above self” and “Earn the right to serve”. His optimism and energy were strongly balanced with analytical bottom-line thinking that allowed him to focus instinctively on the priorities of others. These attributes earned him the trust and confidence of some of the most astute leaders in the business community. Over his career, Bill mentored several successful insurance professionals. His legacy is perpetuated as The Koptis Organization continues to serve the needs of clients and build a bright future. Bill was an avid teacher of the Bible and loved sharing his Christian faith. He had a passion and desire to bring people to a commitment to Jesus Christ as their personal Savior. Bill will be dearly missed by his family, his clients, his associates, and friends.